As an Open Source project, this camera has all the models available, dimensioned drawings for all the metal parts, and a lot of patience required to make your own bellows. With this, you can screw a lens on take a picture, just make sure you get the focus right with some ground glass beforehand. As for why anyone would want a large format camera, there are a few things that big cameras with tiny apertures can do that nothing else can. Here’s the pinhole solution for the Standard 4×5 with a laser drilled hole, and with this camera you’re getting an f-stop between f/240 and f/520. ← WebAssembly: What Is It And Why Should You Care? Thanks so much! I’ve been trying to find this for a long time. I found a way to make better homemade pinholes than the traditional pin-only method, by lapping them after they are made. You know you can’t say something like that without giving some examples. There’s a selfie I want to take, and it’s pretty much impossible without a Civil War-era camera or a lens from a spy satellite. Basically, if you go through some old Civil War portraits, you’ll find some pictures with a *tiny* depth of field. I’m talking about pictures where the tip of the nose is out of focus, the sideburns are out of focus, but the face is in focus. The way you control this is with focal length and aperture, so you have exactly two options: a huge aperture, or a huge focal length. A lens from a spy satellite can theoretically be adapted to any DSLR, and will get you there. Alternatively, you could have a huge focal length, which you can do if you have a camera with bellows. I’ve sourced a lens from a spy satellite. I can rent one for about ten grand a day, and then I would need to adapt it to a DSLR. Or I could build a camera with gigantic bellows. But then I realized I’m just a tech journalist who doesn’t know what I’m talking about and no one really cares anyway so forget it. Google for aero ektar. I have one on my speed graphic. Very nice indeed. Now i’m working on a camera for my ex-U2 spyplane 919mm f8 lens. Weights around 15 kilos. 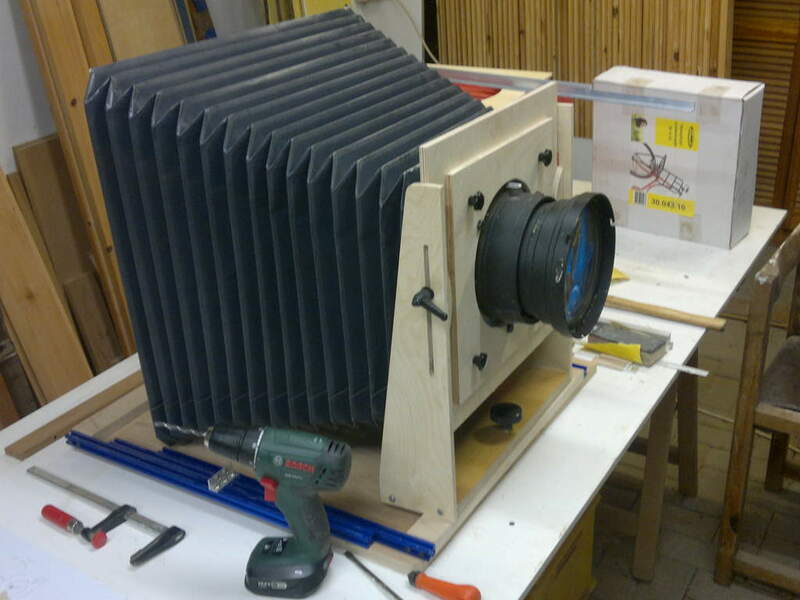 The framesize atm is 50x50cm, but the bellows i’ve made are too short. For decent portraits, it needs to be a meter longer. Large format cameras allow you to tilt/swing both the lens and film planes, so you can select what is in focus. No spy satellite needed. The f-stop such as f/2.8 is written like that because it is a ratio of the focal length (f) to the aperture area (d), or more commonly f/d… hence f/2.8 means that the area of the aperture is that fraction of the focal length. The depth of field (the “circle of confusion”) is affected by these two but also by the sensing medium (broadly, as long as the circle of confusion is smaller than that then as far as one can tell, it’s in focus) and the distance to the subject (even with a small aperture, if you can focus close up, then you can generate a shallow depth-of field). With Brian’s planned large-format camera, massive lens, and a nearby subject (such as a portrait) then you should be able to get someone’s eyes in focus but not the end of their eye lashes (let alone the end of their nose). It’s not limited to large format cameras, but mostly only large format cameras have lens movements– you can move the focal plane alignment and axis of the lens with respect to the film plane. This allows for things you can’t do with cameras with fixed lens/film alignment. One example of this is, you can align the focal plane of a landscape shot to the ground of the landscape. Picture a huge southwestern desert picture. The entire ground can be in focus. Traditionally, you’d have to accomplish this by stepping down the aperture until you have essentially a pinhole. At some point you reach maximum sharpness of your lens elements, and then you run into diffraction limit issues. With a large format camera with lens movements, you can keep your aperture fairly wide open, gather a lot of light, and still keep a HUGE swath of the landscape in perfect tack-sharp focus. Another example is taking pictures of tall buildings. If you just tilt up a standard camera to capture it you get a lot of converging lines. If you use a lens shift, you can capture the whole building without those converging lines. There are other amazing possibilities that are afforded by large format, but that’s a huge one. Very few medium format cameras (Fuji GX680 for example), and almost no 35mm and smaller cameras have lens movements. Canon does tilt-shift optics, Nikon does tilt-shift optics, You get third party tilt-shift optics for Sony E mount, Pentax, and Sony A. There’s a tilt-shift adapter for Hasselblad H-series – there’s even tilt shift for µ4/3. I wouldn’t say that its very hard to get, really. Yes, but their range of movements is extremely limited compared to a full large format camera. And you can only move the glass relative to the back; more like a limited field camera. Yeah, no I agree – compared with a proper large format camera, the perspective control-optics come off more limited. Seems like the cost of sheet film and the chemistry to develop, print, or try to scan those monster size film negs would cost WAY more than the camera. Especially as the vendors who used to compete against one another in the consumables area have left the market. It’s very noble though, and shoes a great understanding of the mechanics/optics involved. I know nothing about phhotography but I would like to know if that kind of camera use traditional film or if there is a digital attachment for it? I’ve not heard of a 4″x5″ (or better yet, 8″x10″) image sensor available from anyone. I know there are sensors for the 2 1/4″ cameras but they’re still out of my price range. (I loved my Bronica SQa-M!) There have been scanning backs in the past which work fine for things like still life, catalog photos, etc. Basically, anything that doesn’t move much. Unless you like the shearing effect caused by scanning a moving object. I believe most large format photographers still use either traditional film or one of the alternate processes. Apart from that, you can do scannerback cameras, but of course the exposure time is quite long, so it’s only usable for static objects. If you have optics with large enough image circle, its trivial to make a scannerback camera with A4(/letter?) flatbed scanner. for those largesense digital backs, it looks like the pixels size is also massive (relative to a ‘normal’ digital detector), so it looks like you lose the resolution benefit of having a larger detector. The digital back for a Mamiya RB67 is (last time I checked) AUD$14,000 – yes, fourteen thousand. 22MP. So I would imagine a full-frame 5×4 sensor would add another zero before the decimal point. Digital photography is great. The end result is what’s really important, but the way you get there is optional. There’s something special about putting your head under the black cloth, composing your image (upside-down) on the ground glass, playing with tilt-and-shift, taking light readings all over the subject, moving the lights or reflectors, take more light readings, then calculating exposure in your head from those readings, shooting a polaroid to test it, then loading up the film-holder, and pressing the shutter release. It’s a ritual, but not a meaningless one – you’re forced to take a careful, measured approach to the subject matter. It’s almost the opposite of point-and-click – and there’s a place for both. I miss playing with a 5×4 monorail. There are adapters available for using medium format digital backs on view cameras. And there were some devices available that acted similar to a scanner to capture the image. Both are fairly cost restrictive though. Great article. I love the website. I now have several ideas for summer projects. The trick if you build one of these is to make your own emulsions, or do something else fun. I have wanted to try making film for a long time. I broke down and sld my 2 8×10 view cameras a few years ago. I still have a 4×5. I have been thinking it might be fun to make a film back out of a sheet of that stuff that glows in the dark. It would be the ultimate disposable camera. Snap a picture and in a few minutes the image has faded. You can make a (barely) workable emulsion from silver nitrate dissolved in water+ethanol, then add some powdered gum arabic and stir until it’s dissolved (or pre-dissolve the gum arabic). Paint or spray this onto high-quality art paper, weight it down to dry flat (or the paper will curl as it dries), then cut it to fit your double-dark. Load and expose! IIRC, it takes a few minutes to expose properly, and it can be processed in DK50 and the usual stop and fixer. You’d have to do some experiments with exposure and processing, but that’s what I remember from playing around with it about 30 years ago. If you don’t put it through a develop-stop-fix cycle and just expose it to sunlight, the image will form by itself but it’s not permanent. A couple of home-made emulsions were a part of my portfolio for entry to photography school, and I remember the interviewers’ eyes bugging when I told them what it was. 1. all the above has to be done in the dark – we’re talking about photo-sensitive materials! Has to be done in the dark, stains anything organic–sounds like something that should be automated. How about going really old school–glass plates won’t curl up! 4. Silver nitrate is toxic, so it might be hard to get (legally….) in most of the more “progressive” countries. I will bookmark this. I actually have a friend who was a chemist for Kodak, and truthfully, this is not a top of the list project, but perhaps next winter… Something to do indoors when it is cold out and dark most of the time anyway! This sounds fun and all, but a quick peek at ebay found multiple complete 4×5 camera options available for less than $300. (and some under $100) The real trick with large format is understanding everything you can do with it. How changes to the front and rear standard affect the image, compensating for exposure lengths if you’re doing closeup work, and more. It can be fun. But at the same time, all of the extra work that goes into getting one image can be daunting for someone new to it.